Voor scheepvaart moet men in de regio Rotterdam zijn. In Rotterdam - Europoort. Maar ook op de Maasvlakte en de havens aan het aangrenzende Calandkanaal. Want alleen daar kunnen de grootste schepen ter wereld komen. Fotograaf en auteur Geert Mast geeft in twee delen Rotterdam - Europoort een voortreffelijk overzicht van de wereldhaven. Waar de bedrijvigheid nooit stopt. En hij laat zien dat alles wat op de wereldhaven Rotterdam betrekking heeft, dynamisch en imposant is. In deel 1 wordt voornamelijk aandacht besteedt aan loodsboten, sleepboten en supertankers, terwijl in deel 2 de grotere schepen zoals shuttletankers en bulkcarriers worden behandeld. Aantrekkelijke boeken voor liefhebbers van de (zee)scheepvaart en zeker voor de 60.000 mensen die werken in het Rotterdamse haven- en industriegebied. Een register completeert het werk. As to shipping, the Dutch seaport of Rotterdam is the place to be. At Rotterdam - Europoort: The Maasvlakte and the docks along the adjacent Caland canal. It is there that the world's largest ships can be found. The super tankers, ore carriers and container carriers are the largest means of transport man has ever devised. We talk about ships with a length of 300 meters or more, a beam of 55 to 60 meters, a draft of 20 meters or more and a height above the waterline of some 30 meters. But the industriousness of the numerous smaller vessels is also to be found here. Situated at the estuaries of the rivers Rhine and Maas, Rotterdam is the seaport in Europe at which by far the largest amounts of the world's soil treasures are transhipped. These raw materials are brought to Rotterdam by the largest ships - the super tankers and ore and coal carriers and together with the agribulk carriers, these are the ships this book is especially dealing with. It shows how impressive they are and how interesting in the company of escorting tugboats, or when berthed beneath the huge cranes. 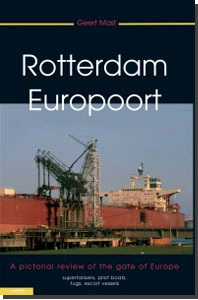 With this Volume I of Rotterdam - Europoort, photographer and author Geert Mast gives an excellent summary of this World Port, an industriousness that never stops. And that everything related to it is dynamic and imposing.